Tonight was Sony Pictures’ chance to shine at CinemaCon with an impressive 45-minute sizzle reel of their upcoming 2012 line-up with the high point being the first time anyone had a chance to see any footage from the upcoming James Bond movie Skyfall, in this case the very first teaser trailer. Before we got to watch it, Sony’s President of Worldwide Distribution Rory Bruer talked about Sony’s slate for 2013 and beyond and confirmed that James Bond would indeed be back in 2014 with the 24th movie in the franchise and the follow-up to Skyfall. 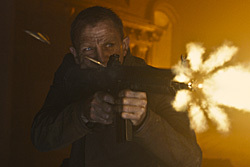 So what can we say about the Skyfall teaser trailer? Well, it was a lot of quick-cut images that were hard to dissect on a single viewing, but this is what we can say about it. It begins with an interrogation scene, possibly a psych evaluation of Bond as someone is doing a word association game with the agent. At first we hear it as narration over a couple of establishing shots of London, starting with “Country” to which Bond responds “England.” “Gun” is next, with the response being “Shot,” followed by “agent” and “provocateur,” and “murder” to which Bond replies “employment.” By then, we’re into the interrogation room and there are three people behind the glass looking on with Dame Judi Dench’s M and Ralph Fiennes’ Mallory being the most prominent, though we’re not sure who the third person was. (In hindsight, either that third person or the interrogator may have been Albert Finney’s character, but we’re not sure.) When the interrogator says “Skyfall,” Bond doesn’t respond so he says “Skyfall” again and Bond says “Done” and gets up to leave. From there, we got a lot of quick shots of a lot of different images, many of Bond running or falling, either into water or from some height. We see him on a barge in front of the Macao casino with the giant dragons in the background, which we saw on set a few weeks back, and he’s running through cars in London, presumably part of his chase after Silva. We also saw the briefest shot of the subway car crash that ends that chase. There was absolutely no sign of Javier Bardem’s character anywhere in the teaser, unless he went by too fast for us to notice and probably only one shot each of Naomie Harris and Berenice Marlohe (and we’re not 100% of the second one). And that’s about all we could get on one viewing, but it definitely got us very excited to see it a second or third time. The trailer should hit theaters with Sony’s Men in Black 3 on May 25. Skyfall opens November 9. Look for our write-up on the rest of what we saw during the Sony presentation later tonight.